joy magnetism: Greenpiphany, and you can, too! I picked up this magnet at the Met. Now here's the weird thing - I can't remember if I've seen it. They say there are prints in the Met, the British Museum in London, and oddly, at Claude Monet's house in Giverny. Maybe I've seen all three. Maybe none. See? Weird. I just bought it because it was gorgeous and blue. Until I read the Met description, I didn't even notice the three boats with fish in them foundering in the water...dang, I could have done a whole Perfect Storm post! Sigh. Moment of silence for the Clooneymagnet that could have been. Anyway, I picked this one for today, because it was the most Mother Earth-y magnet I could find over on the wall. Happy Earth Day! I had my greenpiphany a couple of years ago, which I alluded to before in the Clear2Go magnetpost. I was sitting at my desk at work, skeptically browsing NBC Universal's Green Is Universal campaign, and I read that factoid about how every person who uses a paper cup for their coffee each day...ends up contributing 15(!) pounds(!) of waste every year. As I read that, I looked across my desk and I had three! Cups! I was stunned. See? Greenpiphany. Since then - I've been trying to make as many changes for myself as possible. Some have taken, a lot have not - but the point is that I've tried. And, yes, I see how totally ironic it is that the chick who works for the advertising arm of a public relations company totally got her own perceptions managed by a corporate social responsibility campaign. But, it's oh, so much more! Seriously. Last night, I sat in on a Paley Center panel on Going Green in the Entertainment Industry, which brought together folks from NBC Uni, PGAGreen, Focus Features, Green Media Solutions, and a whole host of other green organizations and green-minded individuals. We started out with a campaign overview of Green Is Universal, and how they go big twice a year - in November and in April, to help raise green awareness on an external communications front. Those are all the green episodes of the major shows, the More You Knows, all the NBCU dotcoms featuring it, all the talk shows have green guests, major advertisers sponsoring green ads (like this fabulous Zachary Levi/Honda Insight spot - LOVE), etc. Even the theme parks are delivering these messages. NBCU took a mere kernel of an idea a few years ago and blew it out through every channel (literally) they could. It's quite an amazing and admirable feat. And a fantastically branded campaign. On an internal front, NBC Universal also walked the walk. They've made several moves to reduce the carbon footprint of their facilities, of their employees, of their operations. And, they've made a move toward trying to green their productions - both television and film. They partnered with Focus Features and the PGAGreen folks to run a pilot program for a no-holds-barred greening of a production - the Sam Mendes film, Away We Go. From composting to biodiesel tranpo, to recycling and branded aluminum water bottles, or local harvesting to recyclable batteries, the producers left no stone unturned when it came to greening this film. The best part is that they involved a third party to help verify the results, so there's no disputing how much they were able to reduce the production's carbon footprint. An even better part about this study is that the best practices learned from this production as well as several others in the pipeline (greenline?) is that they're creating a blueprint (greenprint?) for future productions. It won't be cheap - I have to wonder what percentage of production budgets will have to be earmarked (greenmarked?) for their sustainability efforts. But, at least the groundswell (greenswell?) is beginning. My last paragraph aside, my only worry for the Green Is Universal campaign is that over the last few years, people are being bombarded with green messaging, the market becoming oversaturated with green this and green that. At some point, they just become immune to such messaging. In fact, trendists (ok, fine, futurists?) have been calling for years to switch out green with another organic earth color. So what happens when blue becomes the new green? 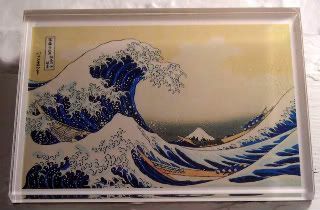 The Sackler Gallery here in D.C. did a Hokusai exhibit a few years ago and that's where I saw this painting. Pretty! I need to go refill my stainless steel water bottle now. Glad you didn't do A Perfect Storm magnetpost, because honestly, I can't handle any discussion of that movie. It scared the crap out of me, and I even run away when I see the DVD jacket at Blockbuster. Have you seen how hot Sebastian Junger is? I was flipping through the channels and stopped on one of those odd little Books on TV channels, and there was this hot guy, reading from this awesome book. I've never watched anything before or since on that channel. Heh. Hmmm, jen, you remind me - I must needs put some stickers on my new water bottle at work! As always, an interesting post, and very well written. Too bad, though you all had be inside on Earth Day. We tended our garden, kept our xB in the driveway and spent as much time outside as possible, til it got so cold our fingers turned blue.